1. Thank you all for your support and "Me too! "s on this past Monday's 52 Weeks Blog Challenge post. Admitting to my crazy was a little scary and intimidating but y'all made me feel safe and 'normal.' So, thank you! It's nice to know I'm not the only one out there with a few quirks. And apparently, it is not the least bit weird or quirky to have kitchen issues. So many of you responded with "Me too!" regarding my kitchen OCDness that I think I'm going to have to wipe those issues off my weirdo list and start saying "I told you so!" to my family when they roll their eyes at me when I loose it over the dishwasher being loaded incorrectly or the knives being out of order in the knife block. I'm not weird, my family is just wrong! 2. I was quite excited to have my blog spammed recently. It was the first time anyone has left multiple, weird, unrelated-to-the-post comments. I feel like I've reached the 'big time' now. I won't be excited the next time it happens though. It was a time consuming pain in the rear to remove multiple comments from multiple posts. 3. My weirdness continues. I've mentioned the diagonally striped blanket I'm knitting a few times now. I'm currently knitting the sides and to get straight, parallel sides when knitting on the diagonal, you must increase on one side and decrease on the other. When I first started the sides, I placed two stitch markers on one side to indicate the need for an increase and one marker on the other side to indicate a decrease. And then the confusion started. Two markers to indicate the increase, which is done by K1, yo, K1. And one marker for the decrease which is handled by K2tog, yo, K2tog. See my confusion? Two markers to indicate a K1 and one marker to indicate a K2... I'm somewhere around 1,000 rows into it now so it's lost the confusion factor but at first... At first, I'd have to stop and think about it every single row. If I ever knit another of these diagonally striped blankets (or anything knit diagonally for that matter) someone Please remind me to mark my increases/decreases differently. As usual, I'm linking up with Carol for today's Three on Thursday. 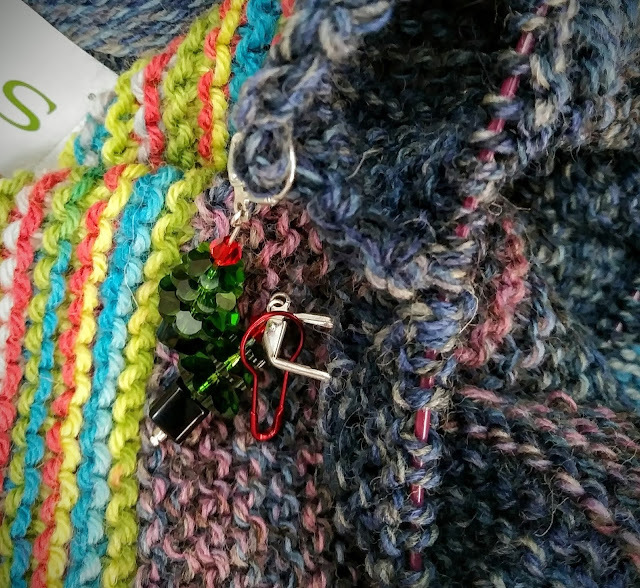 If it weren't for stitch markers I wouldn't be able to knit a thing. You can't have enough of them. I mark everything. I'm laughing over that last one - too, too funny. But I get it. and, you are not weird, rather clever as Kym says. I've been getting multiple comments in languages I don't understand. I just delete the emails I get about them and don't bother with them on the blog. Yup, sometimes our markers add more confusion than they help! I don't think I've ever been excited for blog spam, but congratulations!! I have been confused many times with my knitting or notes I've written down and wonder what was I saying.